Tactical Edition Axe the Fight for Survival begins now! As the inevitable apocalypse approaches, preparations need to be made. Food, Water, and of course Hunting Axe! We take pride in providing outdoor, survival gear for the toughest, demanding environments. Used by all around the world, we are specialized in survival gear for people who need it the most. 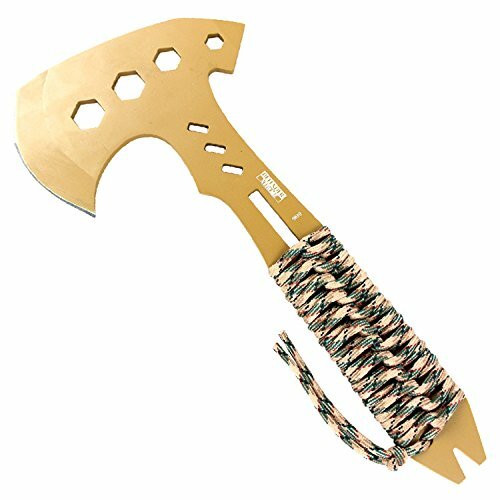 This Tactical Axe is an ultimate tactical weapon. It is lightweight to be carried all day without added muscle fatigue and the blade offers a wide, upswept axe blade for chopping, slashing and cutting potential. Featuring an ultimate design which makes it for an efficient personal defense and breaching tool. It comes complete with sheath for keeping it safe when not in use. If you have any questions about this product by Defender Xtreme, contact us by completing and submitting the form below. If you are looking for a specif part number, please include it with your message.